I have been losing track of time quite recently. Having not cooked anything for the last few days I started looking for new or unusual recipes. I had not made risotto for a while and remembered already trying this recipe a long time ago, and while it is not something new, it certainly is unusual. There are endless variations of risotto and this one has a great combination of flavors. 1. Gently saute the spring onions and ginger in cooking oil and sesame oil for 2-3 minutes. 2. Add the allspice, chilli, and rice. Stir well and add half the stock. Bring to a boil and cook, uncovered for 10 minutes, stirring occasionally. Do not allow mixture to dry out. 3. Add the remaining stock, salt and pepper and return to a boil. Continue to cook 10 minutes, stirring occasionally. 4. 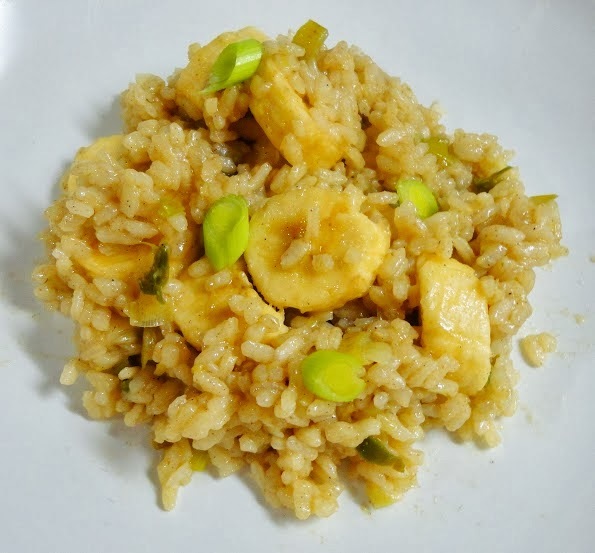 Peel and slice the banana, stir into the rice and continue cooking for a further 5 minutes until the rice is tender, liquid has been absorbed and the risotto is creamy.